Coming up with fun school break activities for teen or preteen kids can be challenging, especially if you want to do something different than the usual go-tos like arcades, trampoline parks or mall shopping. 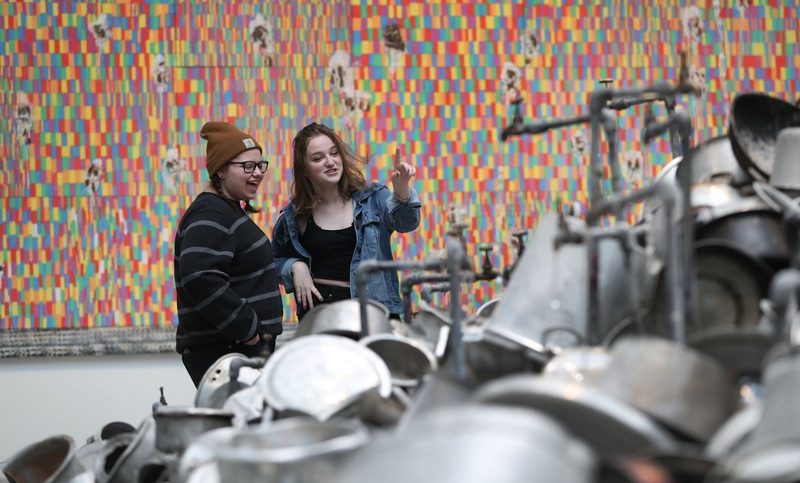 During midwinter break, I took two creative and curious suburban 15-year-olds on an Art in the City adventure, and perhaps it will inspire you to do something similar during spring break. The framework is simple: Start with our world-class modern art museum, move to a small and eclectic art gallery, then finish with a giant art supply store so that freshly inspired kids can make their own art at home. Along the way, integrate as many additional arts stops as you can handle before everyone gets tired or hangry, and add food and drink breaks as needed. Start at the Knox because it requires the most time, but also because we are fortunate to have this amazing collection of works in our city and it deserves to take the lead in a day devoted to art. Modern art, which often has playful and vibrant elements, can be especially kid-friendly. My charges were drawn to the flurry of movement – of both human and dachshund – in the oil painting "Dynamism of a Dog on a Leash" by Giacomo Balla, as well as the stance of Alberto Giacometti's bronze sculpture "Man Walking." Get in line with him and take a Beatles' "Abbey Road"-like pic. 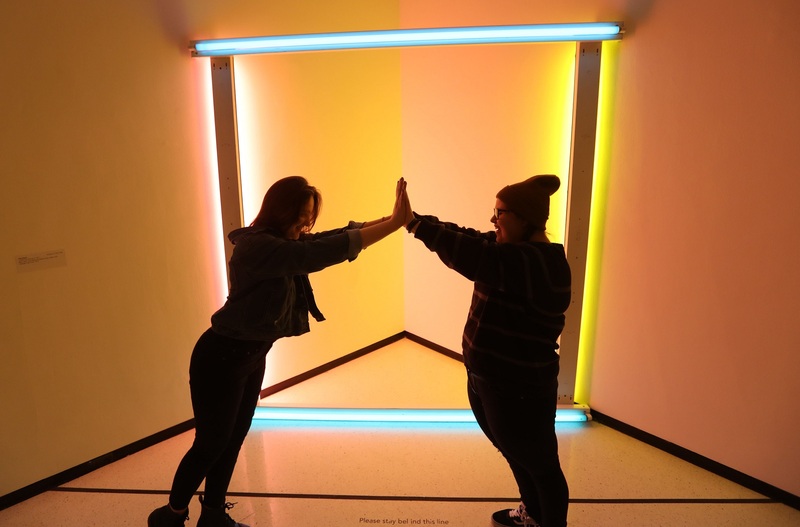 For teens seeking social media photo-ops, Dan Flavin's "untitled (to Donna) 6" is a must: a square of pink, yellow and blue fluorescent lights, it becomes a luminous frame for any creative pose or silhouette. Before leaving, don’t forget the museum store. We had a great time browsing the wide array of items. From $1 postcards to a Shark Girl button to socks featuring the popular Japanese print "The Great Wave," there are many affordable options for kids looking to carefully spend some allowance and bring home a souvenir. Optional stop: The Burchfield Penney Art Center, part of SUNY Buffalo State, is just across the street at 1300 Elmwood Ave. The only museum dedicated to the art and artists of Western New York, it includes the world's largest collection of works by watercolorist Charles E. Burchfield. This unique gallery, opened in 2016, focuses on contemporary figurative art and pop surrealism. It is operated by husband and wife team Craig LaRotonda and Maria Pabico LaRotonda, both artists. The art can skew a bit dark so peruse the website or social media for an advance taste. We saw a diverse array on our visit, including miniatures, paintings on skateboard decks and inspired by a David Bowie video, and the work of many local, regional and national artists. Far from being an intimidating, austere space as some small galleries can be, Revolution Gallery is eclectic, a little bit edgy, friendly and welcoming. 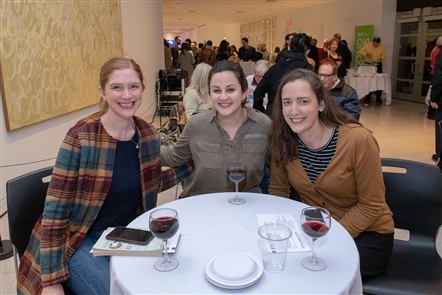 For adults, this gallery hosts evening events like DJ parties, concerts, and food and drink pairings. But plan your day trip accordingly: currently, Revolution Gallery is open only three days a week (noon to 6 p.m. Thursdays, and noon to 8 p.m. Fridays and Saturdays, depending on events). The art on the walls is for sale, of course, but more in line with a teen budget are the prints, jewelry, stickers and other items available at the front of the gallery. Optional stops: The Second Reader Bookshop (1421 Hertel Ave.) and Revolver Records (1451 Hertel Ave.) are neighbors. Both are suited to spontaneous browsing, further the vibe of exploring the city, and help to add literature and music to a day of visual arts. and "We Are Here," by several staffers of the White Bicycle design studio, is on the west wall of 1260 Hertel Ave.
What better way to cap off a day of viewing and appreciating art than a trip to a store dedicated to making your own? Earlier this year, Hyatt's closed its two longtime stores, one in downtown Buffalo and one in Clarence, and opened a massive North Buffalo location to house their retail, professional and online-order businesses. Spend time walking the aisles and browsing. 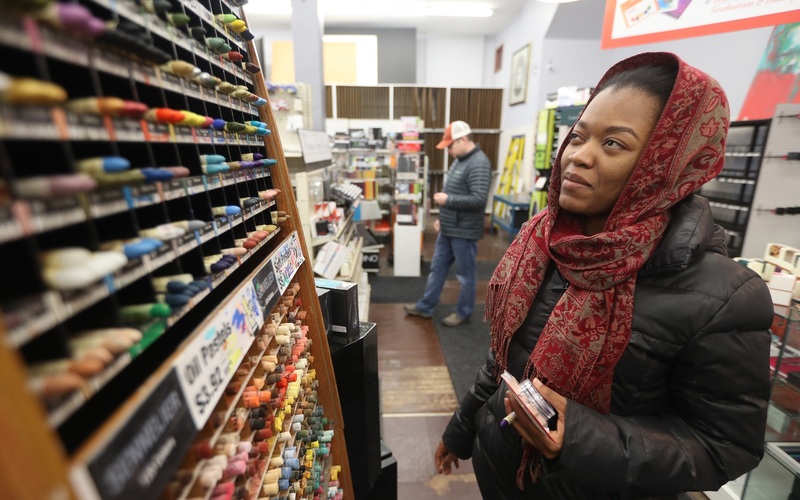 You have likely never realized how many varieties of erasers there are, or the incredible range of paintbrushes available – some that are surprisingly pricey. 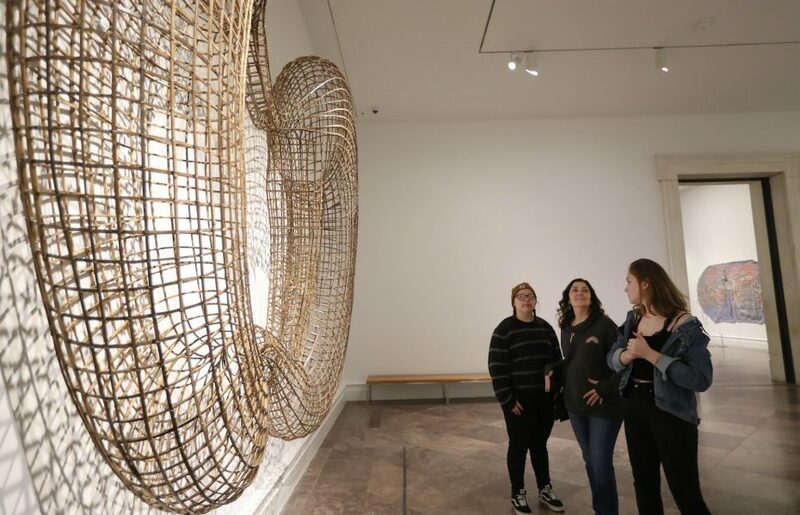 The staff is helpful and plentiful, and there are brochures that list Hyatt's class schedule, should further art education now be on your wish lists. This is an art supply mecca, and, after a day of Art in the City, would-be muralists, painters and sculptors can be motivated to DIY and perhaps bring home some of the tools that will help them execute their own artistic visions.